Bear with me. It’s time for my every other week rave session about The Flash. It’s hard to struggle to find things to gripe about especially with writer Joshua Williamson continuing to deliver some of the best Flash stories in recent memory. Issue #57 is the end of the Sage Force storyline with Flash and Det. Burns trapped in Heat Wave’s mind as he’s under the Sage Force’s thrall. The only way out is with a little help from their friends? Along the way, Williamson fixes a minor gripe I’ve had with the New 52 take on Heat Wave and bring him back more to the traditional version. Commander Cold is filling the Captain Cold void, which is serving as a reminder that Suicide Squad is currently wasting him doing nothing. Scott Kollins’ stint on the book has been outstanding and brings back a lot of great memories of classic Flash stories. It’s cool to think that for many readers the Williamson run will be regarded as one of their favorite takes on the book. Luis Guerrero has been killing it with his color work lately. 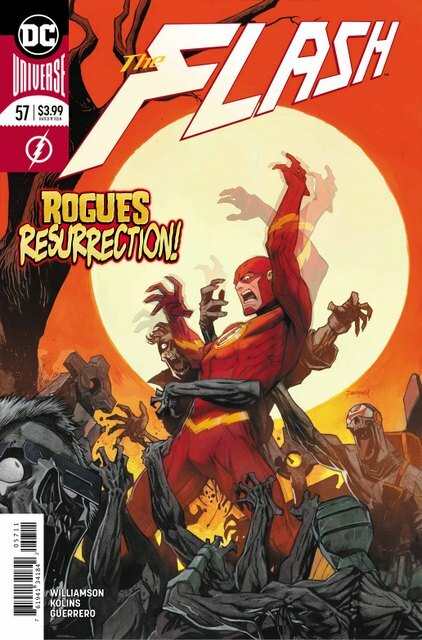 The Flash should be a cheerful, bright comic and the pages reflect that hopeful feel. The timing on this issue is a little weird as this arc still was set before the events in Heroes in Crisis. One thing Williamson has reinforced is that Barry feels a certain sense of loss just from Wally going off to Sanctuary. How he’ll react to his death will be another story entirely. That’s definitely going to lead to some interesting story developments for Barry and Iris, but Williamson sets in motion a major change in direction. This is an exciting one that should be a lot of fun without the typical trappings of a relaunch. Most importantly, Williamson kept all of the essential elements in place for this shift in the status quo. As usual, I don’t have much to complain about with The Flash. It’s steady, consistent and as the epilogue reinforces, is always filled with shocking moments to leave me anxious for the next installment.